Porchetta: Crispy Pork Belly Wrapped Roast: Meat seasoned with herbs wrapped around a pork tenderloin and cooked to juicy, tender perfection. 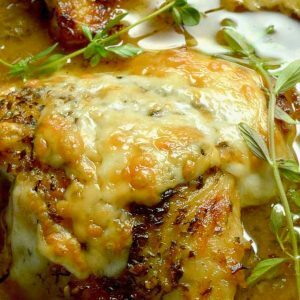 A crazy impressive meal to your guests, but you’ll know how simple it was to make! 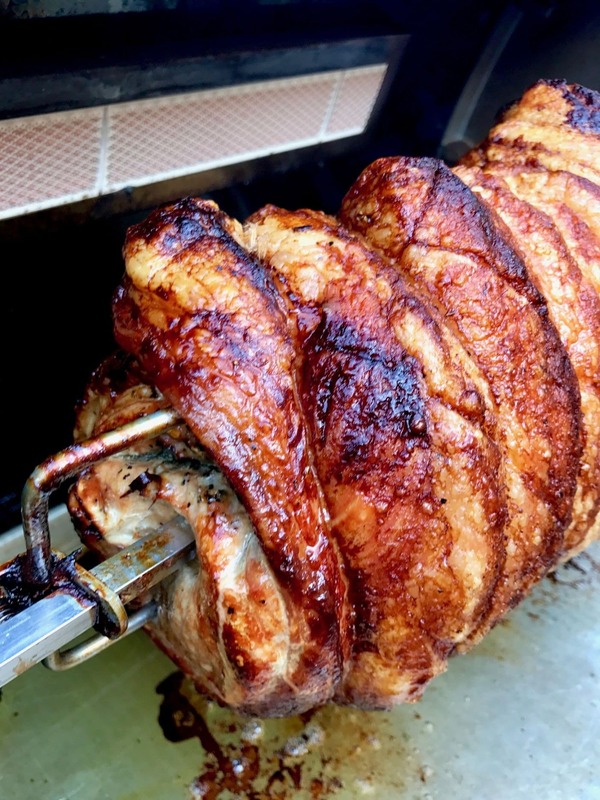 Porchetta: Crispy Pork Belly Wrapped Roast has been on my bucket list of recipes to make for a very long time. Ever since I watched the show “the best thing I ever ate” when former Top Chef Finalist Lee Anne Wong mentioned a restaurant in NYC that served it. I can’t even tell you the name of the restaurant but I have seriously been dreaming about it for what seems like forever. Porchetta is an Italian concept. In fact. its been deemed a food of cultural influence by the government because of its significance in their culture. Although what they make in Italy is a little different that what we make here in the United States. 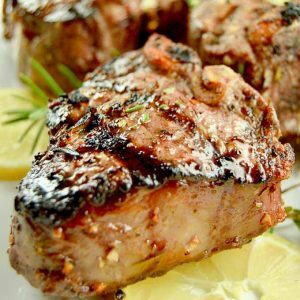 There they use more than just the loin and the belly: often use many parts of the deboned pork and also including the the liver in the rolled roast for extra flavoring. 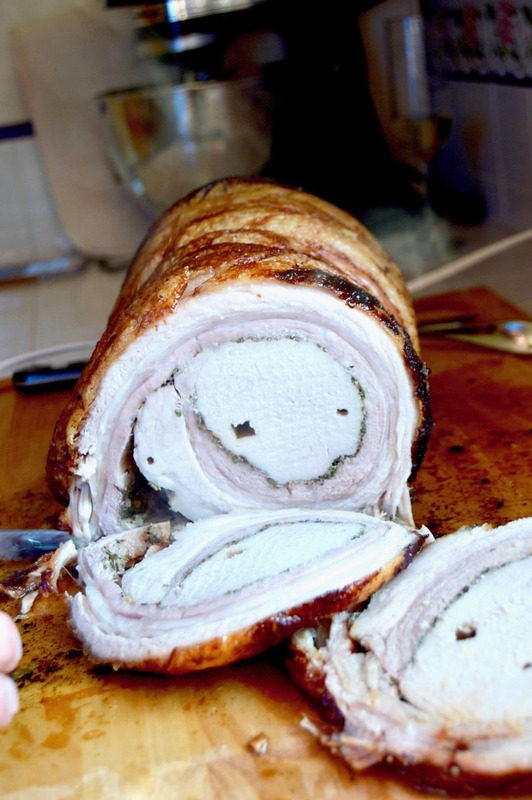 This photo of the Porchetta shows how nice and crispy the pork belly gets when you cook it. Also, see those drippings on the pan…. do yourself a favor and put some potatoes on the pan and cook them at the same time. The potatoes will get nice and crispy and the flavor will knock your socks off! EASY / HARD: Medium, only because you need to tie up the roast after you’ve seasoned and rolled it up. Here is a video showing you how to the it up like a pro. It is done by a Chef at the famous Le Cordon Bleu Cooking school. You can pick different herbs that you like instead of the ones I selected. Many recipes use ground fennel or oregano. Feel free to sub the herbs you enjoy with pork. I suggest a small pork tenderloin for the porchetta. When we made the Porchetta the first time we used a full center cut loin roast. It worked easily as well, but to control the portions I ended up using the tenderloin. 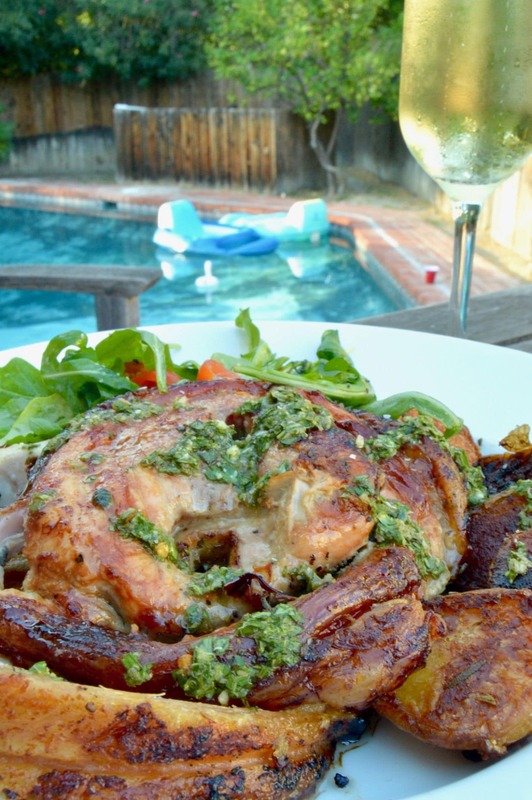 Serve this Porchetta with the Herby sauce for added fresh flavors! 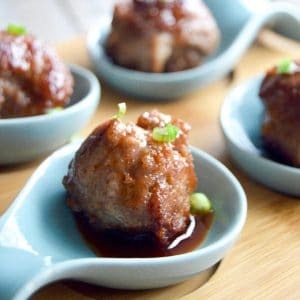 Looking for other recipes to make for company? 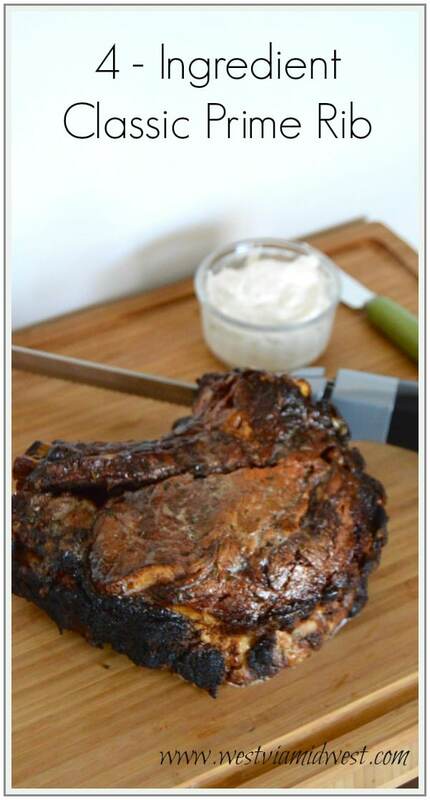 Check out this recipe for French Onion Chicken or this recipe for 4 ingredient Prime Rib! Porchetta, Crispy Pork Belly with herbs wrapped around a pork tenderloin and cooked to juicy, tender perfection. 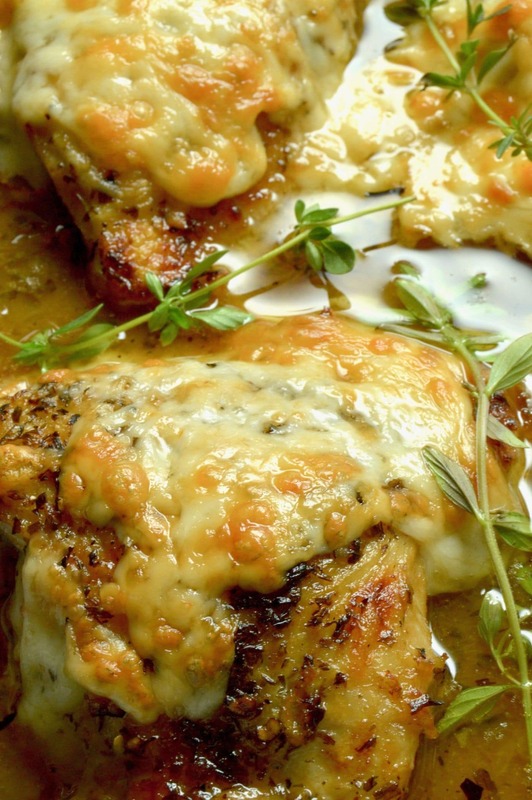 A crazy impressive meal to your guests, but you'll know how simple it was to make! A day before you are going to make the porchetta, place the pork belly on an tray that will fit in your fridge. Sprinkle belly generously with salt. Leave it in the fridge, uncovered overnight up to 24 hours. Dab any liquid with paper towel as you see it. This step is to help dry out the belly so it crisps up easily when cooking. Once ready to cook, score the fatty side of pork belly 1/3" deep so you will see score marks after cooking. (Score in two directions making a checkerboard.) Be sure to score evenly so the roast cooks evenly. Place scored side face down. On inside, spread mustard over entire top of belly. Then sprinkle evenly all herbs (thyme, parsley, sage, red pepper flakes, rosemary) garlic and orange zest. Arrange loin in center. Roll belly around loin so the short ends of the belly meet. If any of the belly or loin overhangs, trim meat. Roll belly around loin; tie crosswise with kitchen twine at 1/2" intervals. See video in post for specific example. Trim twine. Transfer roast to a wire rack set in a rimmed baking sheet. Let porchetta sit at room temp for 1 hour. Then Preheat oven to 500°. 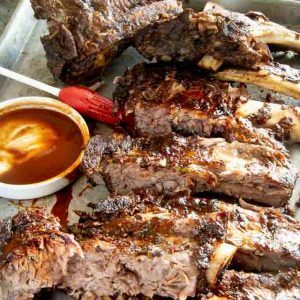 Season with salt generously then place roast in the oven for 40 minutes, turning once at 20 minutes. 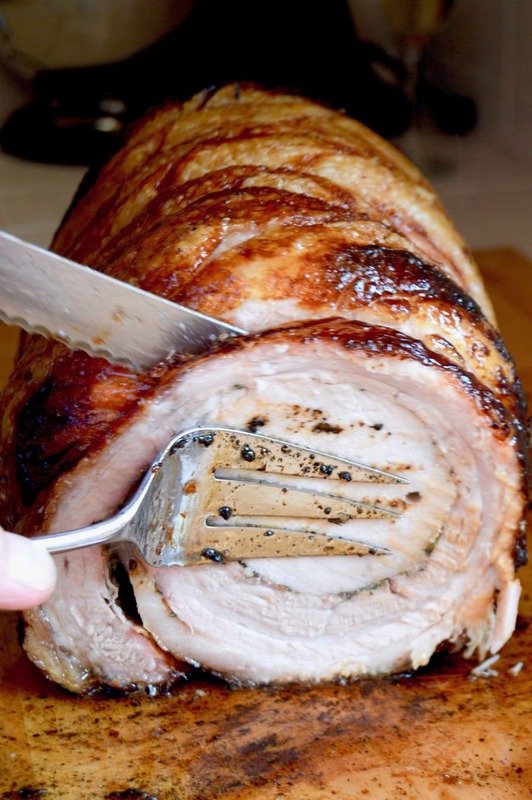 Reduce heat to 300°F and continue roasting, rotating the pan and turning porchetta occasionally, until an instant-read thermometer inserted into center of meat registers 145°F, 1 1/2-2 hours more. If crust is not yet deep brown and crisp, increase heat to 500°F and roast for 10 minutes more. Let rest for 30 minutes. Using a serrated knife, slice into 1/2" rounds. Recipe cooking times do not account for drying of the pork belly before seasoning and rolling. You could make this recipe up until the step you have tied the porchetta ahead of time. Just allow the roast to come to room temperature before cooking and following baking times. 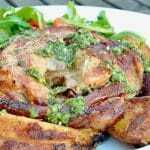 This recipe is adapted from the Porchetta Recipe in Epicurious found here. « Must Make Pumpkin Recipes! Soooo, I watched your Insta stories the day you made this, and I was practically clawing my way through my phone screen. Haha. This porchetta looks amazing! We got a new grill this year, and it came with a rotisserie, so I’ve been actively hunting down things to make on it other than chicken. I’ll be making this next weekend when I have friends over. It looks so perfect for entertaining! This roast is a work of art! I know Johns going to get out the rotisserie as soon as he sees it! I can certainly see why you were dreaming about this — because now I AM! Wow! The funny thing is we actually had pork belly last night (albeit a much smaller piece). I braised it in a bulgogi sauce, sliced and crisped it in a pan and served it over sticky rice with veggies and more sauce. I love the more rustic and barbecued nature of this pork belly — and despite not having a rotisserie for our grill, I’m sure my husband could maneuver something…. This looks luscious! The pictures are from when we did the recipe on a rotisserie, but I did include the info for making it in an oven….. (I don’t have a rotisserie either…. but Im lucky enough to be able and borrow my brothers! ). I just looked up bulgogi sauce…. and mmmmmm I will be trying my next pork belly with that! Thanks for sharing! This is simply crazy delicious!